Writers, if you’re hoping to create a query letter that will grab a literary agent’s interest, you have a HUGE job ahead of you. You’ll need to figure out how to distill the storyline of your entire book into a one- or two-paragraph book summary (sometimes called a book blurb or a synopsis) for your query letter—and do it in a way that will intrigue literary agents and make them want to see more. A daunting task? Yes. An impossible one? Not at all. At Writer’s Relief, our publishing industry experts have been helping writers compose effective query letters since 1994. And today, we’re sharing our best query letter book summary tips with you! These strategies will help you write a query letter synopsis that highlights your book’s strengths and boosts your story’s appeal. Check your emotional baggage at the gate. In the story summary for your query letter, you simply will not be able to include every single plot element that you love—and if you try to, your book blurb probably won’t get the results you hope for. Before you begin to write, take a moment to look inward and identify any potentially difficult attachments. Are you prepared to let certain plot points or characters go unmentioned in order to let other elements shine? Nail your opening line. 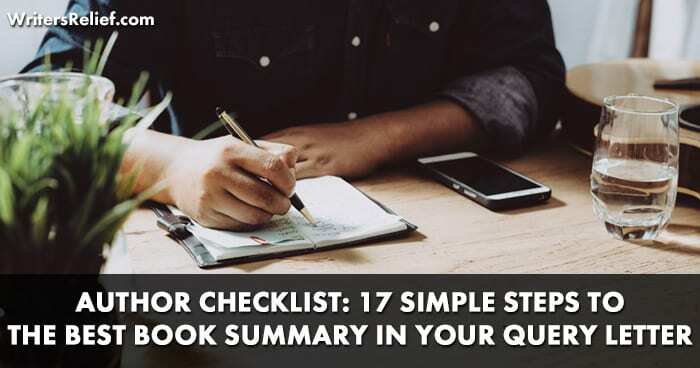 Before you get to the book summary, your query letter must begin with your title, word count, and book genre. This information trifecta gives literary agents a quick-and-dirty overview of what’s to come. Learn more about how to write a great opening line for a query. Compare with care. Comparing your book to one that has already been published could be a helpful strategy for identifying your genre and dangling a promise of future success (based on someone else’s popularity). But sometimes—perhaps more often than not—the strategy backfires. Here’s what you need to know: Should You Make Book Comparisons In Your Query Letter? Keep it short. How long is a query letter synopsis? Generally, a query letter synopsis should be about 150-200 words (broken up into a few paragraphs). Literary agents are busy people, and they have lots of query letters to get through. A query letter book summary is like a two-minute movie preview: You need to grab agents’ attention quickly and entice them to want to see more. If you ramble off on tangents or try to jam every character or backstory into your summary, agents’ eyes will glaze over before they read a single word of your book. Why put yourself at a disadvantage with a bad first impression? Of course, some summaries have been known to go longer—but only under the most absolutely necessary circumstances. HELPFUL HINT: Your entire query letter should be no more than one page long (even if you’re sending it out via email). Skip the thematic descriptions. Phrases like “this is a story about peace and love” or “this is a story that will warm your heart” tend to be empty—that is, not very helpful to literary agents. We usually recommend skipping any thematic description. Instead, write an absolutely fantastic query letter blurb so that readers can see for themselves how the plot of your story explores key themes. If your theme is strong, it should be readily apparent within a description of the story itself. Choose the right point of view for your book’s summary. If you are pitching a book of fiction, chances are your query letter synopsis will be in third-person point of view. But if you are pitching a memoir, you may want to write in first person. Show, don’t tell. You’ve heard this advice before. But did you know it applies to your query letter synopsis too? The act of summarizing necessitates a lot of telling. But good writers exploit the opportunity to spruce up dry summary with intriguing sensory detail. For example: instead of “After hearing her cat had died, Lara was sad,” try “After hearing her cat had died, Lara spent hours looking at cat memes.” Just be sure that you’re balancing detail and summary so that your book blurb doesn’t run too long. Exploit your setting. Fiction is all about the five senses, and when you include a bit of memorable, colorful description in your book summary, you give your reader something concrete to latch on to (and become immersed in) from the get-go. Set the mood. Mood is a key ingredient, and our letter experts have noticed this element missing from many writer-created query letters. Mood is often evoked through word choice. Think of the difference between ebullient and glad. Between sad and forlorn. What mood is evoked by the words you choose? Do they fit your story? Lead with character. More often than not, a good blurb will introduce only one character (or maybe two, specifically if you are writing romance). Identify the most important character and focus your book blurb there. Any other characters can be introduced via the experience (and perspective) of your protagonist—always maintaining the focus on the “MC.” With a single POV—rather than a whole bunch of perspectives—the agent may be more inclined to connect with your story. HELPFUL HINT: If you’re writing an ensemble cast story, or if the strength of your book is a colorful group of characters, you may want to mention the most interesting characters and their unique conflict—with emphasis on the group rather than individuals. Just be sure to show how your many characters’ storylines come together. Plot against subplots. Although you (rightly) adore your subplots, a query letter blurb must be short. Use the two paragraphs you have to laser focus on your book’s main drama, and leave out the extra. Be more specific. Generalizations rarely make strong impressions; it’s details that stick with readers. What makes your characters tick? What makes them memorable and relatable? Tease out the tiny details that make your characters real, and use them to provoke empathy in your letter reader. Go “all in” on high stakes. What’s the worst thing that will happen if your empathetic protagonist fails to succeed? The big, terrible, immediate consequences of failure can help your letter reader feel emotionally invested in your story. Learn more: 8 Techniques To Up The Drama Factor In Your Short Stories. Appeal to the human element. To create a good blurb, focus on the things about your book that appeal to universal human emotions and desires—elements that everyone can relate to. Turn off your flash. A query letter blurb is not the place to razzle-dazzle readers with your billion-dollar vocabulary or your ability to spin out sentences the length of airstrips. Most literary agents are reading quickly; too much showiness can be a stumbling block. Revise for precision. Because a query letter can’t include every single detail of what makes your story great, you must use precise, gripping language to convey your plot. Choose exact verbs instead of murky ones like “seem” or “being.” Also, choose interesting language that reflects the style, tone, and mood of your book. Don’t include spoilers. A query letter synopsis should never, never, ever give away the ending of your story (unless you’re writing memoir—in which case, the author biography section of your query might inadvertently give away your present circumstances). Think of your query letter book summary as a hook: The idea is to make literary agents so desperate to know what happens next that they must request the complete manuscript. HELPFUL HINT: Although you should not include the ending of your story in your query letter, it is of paramount importance that your one- or two-page book synopsis does include details about your book’s conclusion. Once you have a working knowledge of the characteristics of a strong query letter book blurb, it’s time to put theory into practice. Let’s do that by dismantling a well-known story (The Wizard of Oz movie version) and breaking down its parts into the building blocks of a strong query letter blurb. How can a writer decide what action merits inclusion in a query letter, and what plot elements should be left for the separate, full-length synopsis? Most of the time, story starts with character: Who is the main character? Whose perspective/viewpoint is most dominant? Who has the most to lose? So it goes without saying that, in our example, Dorothy is the main character. She and her three companions all have something to lose (their lives) and something to gain, but of the four, Dorothy has the most to lose (she also must get back to Kansas or never see her family again). A strong choice for a story summary would be to filter the synopsis through Dorothy’s POV. But who is Dorothy? What makes her memorable? Dorothy is a misunderstood country girl with big dreams. What does the main character risk externally: her finances, his job, a favorite coffee mug? Her life. There’s a nasty witch after her. What does the character risk internally: her peace of mind, his respect, her mother’s understanding, his children’s esteem? If Dorothy doesn’t get back to Kansas, she’ll never see her family or home again—which is especially terrible because she’s only just now realized how very important they are to her. Internal conflict and external conflict are often the two main points of tension that comprise the focus of your query letter as it is filtered through your main character’s point of view. Set the mood.If your book is set in a great locale, describe it energetically and meaningfully—but briefly. If the setting isn’t memorable or isn’t important, consider diving right into the action. Dorothy, a misunderstood country girl who longs for a different life, is whisked away from her dust-dry Kansas farm into the magical, colorful world of Oz when her house is sucked into a tornado. Identify the key conflicts in concrete terms.Show us what your character stands to lose through his/her eyes. Only a magician called the Wizard of Oz has the power to send Dorothy home—but he lives in far-off Emerald City. So Dorothy must head off to see the Wizard down a mystical and perilous yellow brick road. Show advancing, specific action(but not too much). Once the main conflict has been identified, it’s time to touch briefly upon the obstacles that impede success. If there are many obstacles, choose the ones that are most surprising, exciting, and interesting. But Dorothy’s arrival has accidentally incurred the ire of an evil wicked witch, so her journey to find the Wizard of Oz is also a matter of life and death. With the help of three new companions—a scarecrow, a tin man, and a lion—Dorothy finally reaches Emerald City. However, the Wizard demands a trade: He won’t help Dorothy and her friends unless they first kill the wicked witch, who is also terrorizing Oz. You’ll notice there’s no mention in our summary of ruby slippers or Toto. We don’t give away the Wizard’s secret identity. We don’t get into descriptions of munchkins, or Glinda’s role, or even the killing of the Witch of the East. We love those elements—we really do! But a query writer must sometimes make difficult choices—striking a balance between detail and action. Lead the reader to the climactic moment. While you don’t want to give away the ending, you do want to walk the literary agent right up to the cliffhanger of the story. Will Dorothy, who never saw the value of her home and family until now, make it back to Kansas with her life? From this query letter synopsis example, you can see how to identify the important points of a story. This method might not work for every novel or book, but we hope these prompts will offer some helpful insight. Generally speaking, professional writers know that before one begins to bend, tweak, or break accepted query letter guidelines, attempting to write a query that lies within those guidelines comes first. It’s only when you understand how the rules work that you can be 100 percent sure about your decision to break them. Before you write a query letter that ignores publishing industry etiquette, try writing one that stays within the lines. Then, modify with care as needed. That said, there is one query letter rule that we recommend you do not ever, ever break. A query letter should be one page and no more. Writers whose query letters go on longer—much longer—can come off as being long-winded or even discourteous, because overlong query letters unnecessarily take up a lot of time to read. Don’t try to be the exception to this rule. Learning to write a query letter is a key skill for writers that will last their entire lives. And remember: Your query letter doesn’t have to be perfect on the first try. That’s what revisions are for! Writer: Can you help us? Please share your best tip for writing a query letter. Thank you for being part of our community!